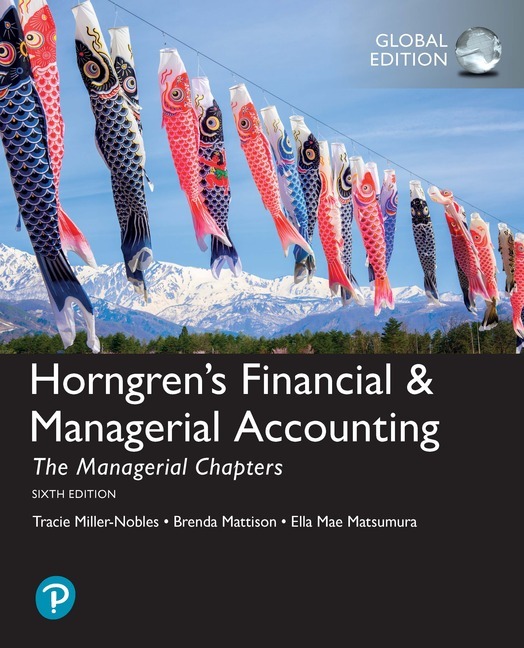 Horngren’s Financial and Managerial Accounting, The Managerial Chapters presents the core content of principles of accounting courses in a fresh format designed to help today’s learners succeed. As teachers first, the author team knows the importance of delivering a student experience free of obstacles. Their pedagogy and content uses leading methods in teaching students critical foundational topics and concentrates on improving student results--all tested in class by the authors themselves. With this in mind, the 6th Edition continues to focus on readability and student comprehension and takes this a step further in the managerial chapters by employing a new theme to help students see how managerial accounting is used as a tool to help all business people make decisions. By providing more meaningful learning tools, this title gives professors the resources needed to help students clear hurdles inside and outside of the classroom, like never before. Pearson MyLab™ Accounting is an online homework, tutorial, and assessment program designed to work with this text to engage students and improve results. Within its structured environment, students practice what they learn, test their understanding, and pursue a personalized study plan that helps them better absorb course material and understand difficult concepts. Students, if interested in purchasing this title with Pearson MyLab Accounting, ask your instructor for the correct package ISBN and Course ID. Instructors, contact your Pearson representative for more information. o Types of budgets, including participative, zero-based, and continuous ones. o Performance reports using static budgets, including the advantages and disadvantages. · NEW! Problem has students complete a trend analysis and ratios to analyze a company for its investment potential. · NEW! Section to illustrate how companies record the payment of payroll liabilities. · NEW! Appendix (5A) discusses multiple performance obligations. · NEW! Using Excel. This end-of-chapter problem introduces students to Excel to solve common accounting problems as they would in the business environment. · NEW! Tying It All Together feature ties together key concepts from the chapter using the company highlighted in the chapter opener. The in-chapter box feature presents scenarios and questions that the company could face and focuses on the decision-making process. The end-of-chapter business case helps students synthesize the concepts of the chapter and reinforce critical thinking. · NEW! A Continuing Problem starts in Chapter 1 and runs through the financial chapters. The managerial chapters’ continuing problem has been revised for this edition and emphasizes the relevant topics for that chapter using a continuous company. · Effects on the Accounting Equation illustrations help students see connections between transactions, as well as how transactions fit into the big picture. Located next to every journal entry, they reinforce the connections between recording a transaction and the effect those transactions have on the accounting equation. · Instructor Tips & Tricks throughout the text mimic the experience of having an experienced teacher walk a student through concepts on the board. Many include mnemonic devices or examples to help students remember the rules of accounting. · Common Questions, Answered is rooted in the authors’ teaching experiences over the years, and offers additional help with patterns and rules that consistently confuse students. Located in the text’s margin next to where the answer or clarification can be found, they help students better understand difficult concepts. · Try It! boxes found after each learning objective give students opportunities to apply the concept they’ve just learned by completing an accounting problem. Links to these exercises appear throughout the eText, allowing students to practice in Pearson MyLab™ Accounting without interruption. · Things You Should Know provide students with a brief review of each learning objective presented in a question and answer format, helping to prepare them for exams. Students can also link to multimedia materials from within the Pearson eText. · Chapter Openers present relatable stories that set up the concepts to be covered in the chapter. The implications of those concepts on a company’s reporting and decision-making processes are then discussed. · Decisions Boxes highlight common questions that business owners face, prompting students to determine the course of action they would take based on concepts covered in the chapter. · IFRS icons provide guidance on how International Financial Reporting Standards (IFRS) differs from US GAAP throughout the financial chapters. · A Practice Set starts in Chapter 2 and goes through the financial chapters, providing another opportunity for students to practice the entire accounting cycle. The practice set uses the same company in each chapter, but is often not as extensive as the continuing problem. · Helios Digital E-Cases use the power of storytelling to engage students and help them connect course content to real-world scenarios. Delivered in partnership with Helios Digital Learning, these multimedia e-cases illustrate fraud and ethical principles using real-life characters, experiences, and stories. Narratives speak to students, not at them, creating an immersive and engaging learning experience through which students acquire, retain, discuss, and integrate important course concepts and ethical lessons. · A Comprehensive Problem for Chapters 16-20 covers fundamental managerial accounting concepts: job ordering, process costing, cost management systems, and cost-volume-profit analysis. · A Comprehensive Problem for Chapters 22-24 covers planning and control decisions for a manufacturing company, including a master budget, flexible budget, variance analysis, and performance evaluation. · A Comprehensive Problem for Chapters 25-26 covers decision making, both short-term business decisions and capital budgeting decisions. · Accounting Cycle Tutorial. The Pearson MyLab Accounting interactive tutorial helps students master the Accounting Cycle for early and continued success in the Introduction to Accounting course. The tutorial, accessed by computer, smartphone, or tablet, provides students with brief explanations of each concept of the Accounting Cycle through engaging, interactive activities. Students are immediately assessed on their understanding and their performance is recorded in the Pearson MyLab Accounting Gradebook. Whether the Accounting Cycle Tutorial is used as a remediation self-study tool or course assignment, students have yet another resource within Pearson MyLab Accounting to help them nail the accounting cycle. o NEW! ACT Comprehensive Problem. The Accounting Cycle Tutorial now includes a comprehensive problem that allows students to work with the same set of transactions throughout the accounting cycle. Assignable at the beginning or end of the full cycle, comprehensive problems reinforce the lessons learned in the accounting cycle tutorial activities by emphasizing the connections between the accounting cycle concepts. · Auto-Graded Homework with Learning Aid. Pearson MyLab Accounting homework and practice questions are correlated to the textbook, regenerate algorithmically to give students unlimited opportunity for practice and mastery, and offer helpful feedback when students enter incorrect answers. Learning aids, such as Help Me Solve This, DemoDoc Examples, and concept videos provide extra help for students at the point-of-use. · Worked Out Solutions. Sometimes students need more than just the correct answer to understand their mistakes; they need to understand how to get to that correct answer. Worked Out Solutions are available to students when they are reviewing their submitted and graded homework. The Worked Out Solutions provide step-by-step explanations on how to solve the problem using the exact numbers and data that was presented to the student in the problem. · The Pearson eText keeps students engaged in learning on their own time, while helping them achieve greater conceptual understanding of course material. The worked examples, animations, and interactive tutorials bring learning to life, and algorithmic practice allows students to apply the very concepts they are reading about. Combining resources that illuminate content with accessible self-assessment, Pearson MyLab Accounting with Pearson eText provides students with a complete digital learning experience--all in one place. o And with the Pearson eText 2.0 mobile app (available for select titles) students can now access the Pearson eText and all of its functionality from their computer, tablet, or mobile phone. Because students’ progress is synced across all of their devices, they can stop what they’re doing on one device and pick up again later on another one--without breaking their stride. o NEW! Try It! Solution Videos. Author-recorded and accompanying all Try It! Exercises, these videos walk students through the problem and solution. o NEW! Interactive Exhibits allow students to engage with key exhibits within the Pearson eText. Students can work with journal entries, modify an exhibit’s data to see the resulting impact and effects, or watch a video explanation of key concepts. · Personalized Learning. Not every student learns the same way or at the same rate. With the growing need for acceleration through many courses, it's more important than ever to meet students where they learn. Personalized learning in Pearson MyLab Accounting gives you the flexibility to incorporate the approach that best suits of your course and your students. o The Study Plan acts as a tutor, providing personalized recommendations for each of your students based on his or her ability to master the learning objectives in your course. This allows students to focus their study time by pinpointing the precise areas they need to review, and allowing them to use customized practice and learning aids--such as videos, eText, tutorials, and more--to get them back on track. Using the report available in the Gradebook, you can then tailor course lectures to prioritize the content where students need the most support--offering you better insight into classroom and individual performance. o Dynamic Study Modules help students study effectively on their own by continuously assessing their activity and performance in real time. Here's how it works: students complete a set of questions with a unique answer format that also asks them to indicate their confidence level. Questions repeat until the student can answer them all correctly and confidently. Once completed, Dynamic Study Modules explain the concept using materials from the text. These are available as graded assignments prior to class, and accessible on smartphones, tablets, and computers. NEW! Instructors can now remove questions from Dynamic Study Modules to better fit their course. o Open Response Questions require students to type in their answers instead of choosing them from a drop-down menu. This helps students think critically while further preparing them for the format of their exam. o An Algorithmic Testbank allows instructors to create tests with unique values for each student. · Robust Gradebook tracking. The online Gradebook automatically tracks your students' results on tests, homework, and practice exercises and gives you control over managing results and calculating grades. The Gradebook provides a number of flexible grading options, including exporting grades to a spreadsheet program such as Microsoft Excel. And, it lets you measure and document your students' learning outcomes. · Animated Lecture Videos. This pre-class learning aid, available for every learning objective, is a professor narrated PowerPoint summary to help students prepare for class. · Learning Management System (LMS) Integration. You can now link from Blackboard Learn, Brightspace by D2L, Canvas, or Moodle to Pearson MyLab Accounting. Access assignments, rosters, and resources, and synchronize grades with your LMS Gradebook. For students, single sign-on provides access to all the personalized learning resources that make studying more efficient and effective. · Reporting Dashboard. View, analyze, and report learning outcomes clearly and easily, and get the information you need to keep your students on track throughout the course, with the new Reporting Dashboard. Available via the Pearson MyLab Accounting Gradebook and fully mobile-ready, the Reporting Dashboard presents student performance data at the class, section, and program levels in an accessible, visual manner. · Easily scalable and shareable content. Pearson MyLab Accounting enables you to manage multiple class sections, and lets other instructors copy your settings so a standardized syllabus can be maintained across your department. Should you want to use the same MyLab course next semester, with the same customized settings, you can copy your existing course exactly--and even share it with other faculty members.